Wayne Gretzky once said that he doesn’t skate where the puck is, but rather where it is going to be. He anticipated the next move, took the risk and that is what made him stand out from his peers. Singing the Star Spangled Banner is a risk in and of itself as most singers who have attempted it will tell you. It’s a densely written poem that doesn’t lend itself to easy memorization of words or cadence and its got a few killer notes sprinkled amongst the 1.5 octaves of the song. The Urban Dictionary calls it the “sorting hat” of songs as it separates the great vocalists from the flash in the pan pop fad of the moment. Many contemporary singers change it up because they simply can’t sing it as written. Singing the anthem at a sporting event is even tougher because it is often done a cappella. Of course if you’re in an indoor venue, you have the lovely challenge of a 2-4 second audio delay so your voice reverberates back in your face. You’re singing one verse yet hearing another. I’ve had to give a presentation with that problem, it’s massively confusing and all I had to do was read the PowerPoint slides, not get my vocal chords to stretch in ways that probably make them angry. So a tip of my hat to all who sing it and sing it well. But those are the known risks. And those should be all there is, especially when you’re singing in your hometown. The hometown where you grew up and where you returned despite hitting the big time and it probably behooves your career to live in LA and NY instead. The hometown where you intend to educate your child. The hometown where your support local arts and local children's charities. Yet, in the case of the NHL All-Star game, that very scenario actually created risks. Risks of being booed, risks of people being so full of themselves who think that standing there in a protest as tiny as their…..ears…and not applauding somehow makes anyone look bad but themselves. 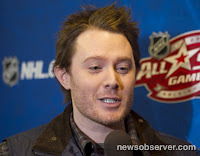 So Clay Aiken skated where the puck was going to be. He walked out, tall and proud and sang that ridiculously difficult song-the one ironically (or perhaps fittingly) about persevering while under fire. And he nailed it like Zdeno Chara nails a slapshot. And the vast majority of the fans in the audience applauded; for the song, for the singer and for their gladiators on the ice. And then he walked out with his head held high to prepare for a charitable event on Broadway next Monday and his tour which begins on February 10th. The same tour where VIP packages are being auctioned off at every venue and he’ll give up part of his personal time to raise money for his children’s charity. I’m no Pollyanna. He’ll drive me crazy at times when he digs in his heels against things that are good for him. I was as relieved that he didn’t have unflattering mile high spikes as I was that he sang so well and had just the right amount of stubble. But I know a good man when I see one. And I saw one yesterday standing on the RBC ice. 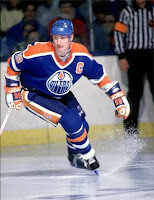 On a secondary note, I need to follow hockey again. Most of the guys I remembered when I followed the Bruins didn’t look as good as those guys yesterday. Besides, I need something to watch until baseball season starts, right?